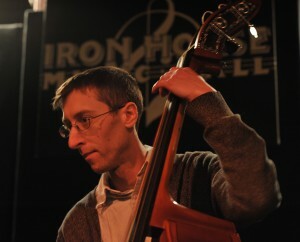 A recent transplant to the area, bassist Tyler Heydolph brings with him a wealth of teaching and performance experience. He has studied with jazz greats Marcus MacLaurine (Clark Terry, Abdullah Ibrahim) and Cameron Brown (Joe Lovano, Dewey Redman). As a performer Tyler has anchored the groups of Charles Neville, Miro Sprague, Alex Snydman, Doug Abrams, Michael Kolodny & Jeff D’antona. In addition to his work with jazz and improvised music he has also performed with the Keene Chamber Orchestra, the Windham Orchestra, hip hop/groove trio Illasamatyc and folk icon Roger Salloom.